शादी-ब्याह के माहौल के उल्लास में वृद्धी चौगुनी हो गई जब इंदिरा कालोनी के सबसे वरिष्ठ दंपत्ति – गुप्ताज़ मंच पर आए।मेरी प्रकृति के विपरीत, न जाने क्यों , मैं भी इन बेहूदे पलों का बेहद आनंद ले रहा था। यहाँ गुप्ताइन ने पहला ठुमका मारा ही था कि गुप्ताजी ने जो सीटी बजाई कि हम सभी वहीं खड़े खड़े लोटपोट हो गए। आज वातावरण कुछ अलग था। सदियों से काम के अभाव में खाली बैठी स्त्रियों की कौम आज अत्यंत व्यस्त थी। कोई नमक मिर्च वाली बातें नहीं , कोई इधर की उधर नहीं और न ही कोई मायके-ससुराल के दुखड़े। कुछ अलग ही दिन था आज। अचानक बेला की कही एक बात याद आ गई कि ” भारत में सभी औरतों के सभी दिन एक समान होते हैं “| बेला आमतौर पर कुछ गलत नहीं कहती पर यह तो अतिश्योक्ति हो गई। चलो मान लेते हैं कि ये सच है कि औरतों के सभी दिन समान होते हैं , पर आज का दिन ? आज तो सभी औरतें बहुत खुश थीं। वैसे माँ और बेला तो हमेशा ही खुश रहते हैं, पड़ोस वाली माथुर आंटी भी, बिट्टू की पड़ोसन भी और खुद बिट्टू भी। एक मिनट…क्या ज़्यादातर औरतें खुश रहती हैं हर दिन? तो फिर वाक़ई में औरतों के सभी दिन एक समान होते हैं? 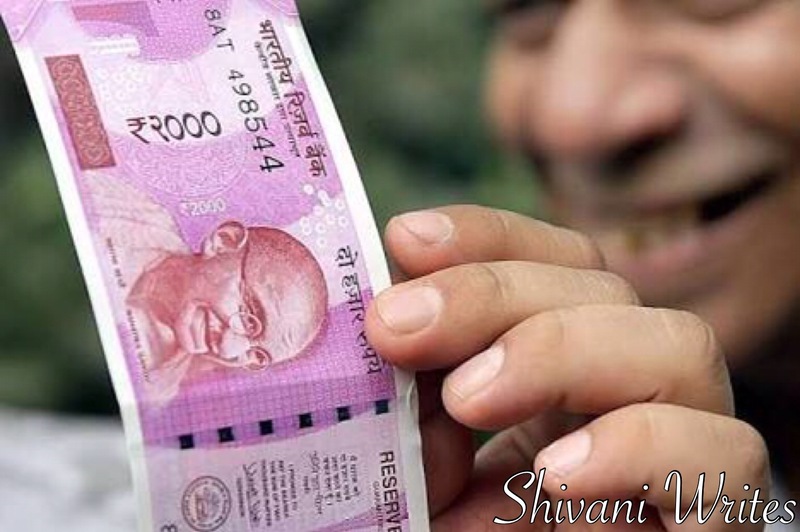 तालियों की गूँज से वापस मैरिज हॉल में आया तो देखा – गुप्ताजी बिंदी लगा रहे थे गुप्ताइन को। मैं मुस्कुराया। औरतों के माथे पे टिकी ये वही ब्रहाण्ड रूपी बिन्दी है ! Returned to my room at 8:30 o’clock in the evening from bank. My phone rang. It’s Dad.He chuckled, “Why is your mom taking out all of her 10-15 purses and extracting from the deepest of pockets, currency notes of ₹ 500 and ₹ 1000 ? What is it they are playing on TV ? It was Nov. 8, 2016.Completely unaware of what is happening , I asked my Dad to give me sometime to catch up with the news. I switched on the TV. Surprise ! Surprise ! 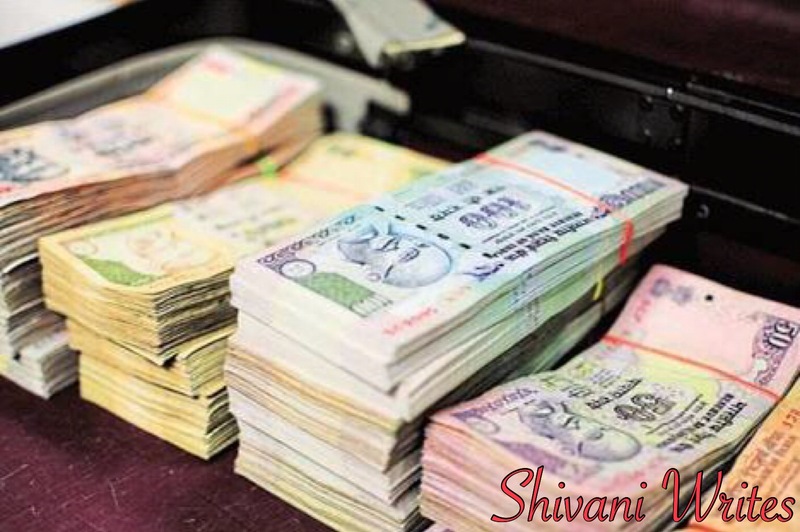 The News Reporter peeped through the 20% of area available on screen for him ( 80% being flashes, headlines, advertisements and tweets ) screamed at the top of his voice that – from Nov. 9th onwards ₹ 500 and ₹ 1000 banknotes cease to be legal tender. My eyebrows raised as a banker imagining ‘ How this surprise move is going to change my job profile for next few months‘. My eyebrows raised as common man , scratching head , thinking ‘ How this thing is going to influence me, by the way , what the hell is this demonetisation?‘ And somewhere else, the unnerved corrupts raised their eyebrows to widen their eyes so as to absorb even a single hint of hope , of relief to keep the stacks and racks of hoarded currency hold some value. Nevertheless, What occupied my mind was a single flash on TV screen that read ‘ Banks to stay closed Tomorrow ‘ ( observed later that it added ‘for public’ in faded letters). Avoiding the floods in official whatsapp group , first thing I did , was calling my Branch Manager to ask if it’s holiday tomorrow? With a straight face he said, ” No financial transactions to be carried out tomorrow so you are expected to stay on field for Recovery “. I hushed ” Damn! 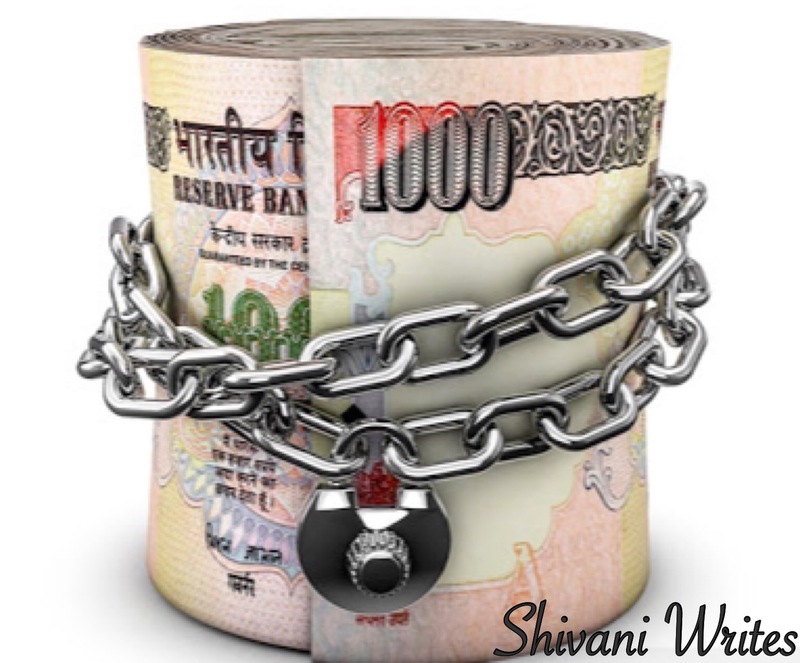 Not even this surprise demonetisation move can bring change to my routine.” But deep inside , I was anticipating a change, not in my routine, but a change in the things going around at this moment. The wheels of change are set into motion. 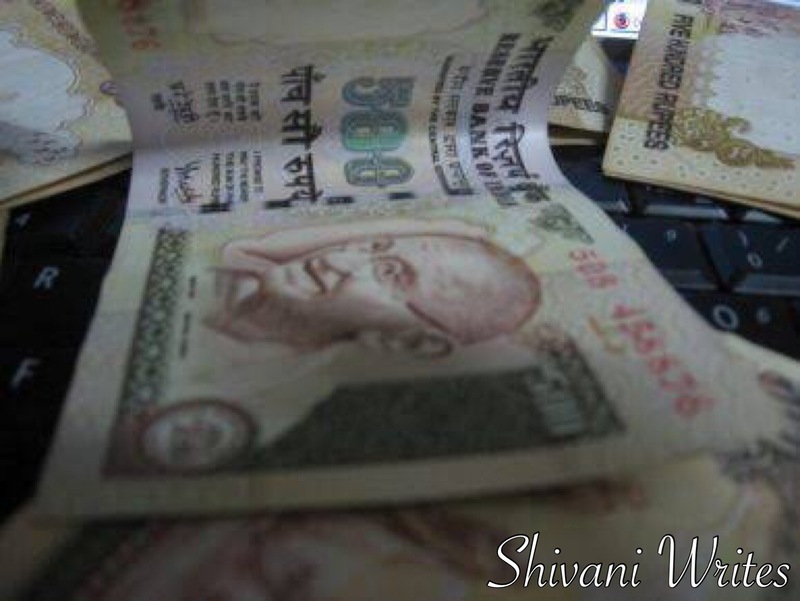 To continue reading click here Shivani Writes More. And in the days that followed, India saw it all : the bitter-mouthed opposition, the complaining citizen ( these are the ones over-reacting initially) and the innumerable jokes and trolls sprawling all over the social media with hashtag demonetisation and black money and oops the hashtag Roll-off. Believe me! The bankers who sweated through days and nights will not even give you a chance to re-think if you say ‘ Roll-off this demonetisation’ in front of them. They have worked their heads off , skipping lunch ( appreciate Khokrakalan ) , sleeping least just to keep everything in the right place. Rome was not built in a day and this introduced change is just a drop in the ocean , enough said. Thinking of that chemistry lab experiment in which the single drop added from the Burette to the beaker made all the difference and concluded the calculation. Change is the keyword here. ” All Change is hard at first, messy in the middle and Gorgeous in the end”. And we have seen India go through worse , this being just a beginning, a challenge, a surprise attack to the very roots of corruption. We have all dreamt of a Better India then why are we cringing away from the roles we are allotted to play? As a banker I have seen myself spraying volini and likewise on my back and the swollen sleep-deprived eyes of my colleagues. 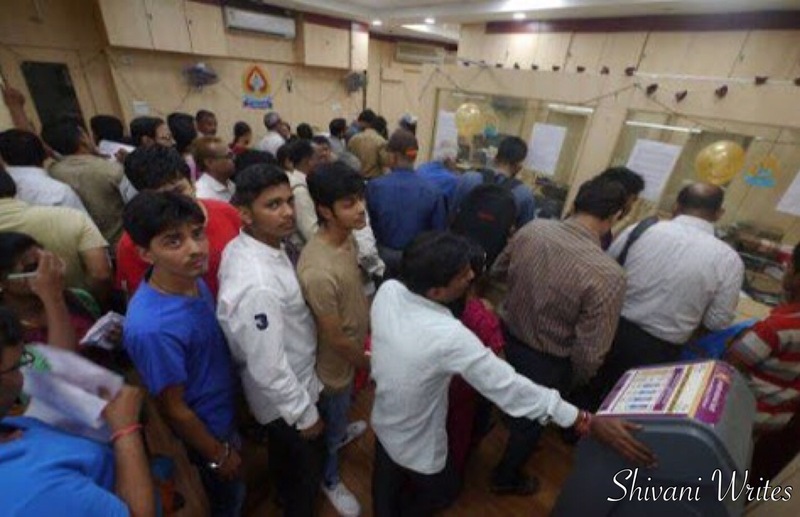 And as a common man I have seen my Mamaji stand in a bank queue for 5 hours just to get cash for my Mausiji’s funeral. And I have seen a soldier calmly waiting for his turn to ask for lower denomination banknotes for shifting his wife and 3 year old to Sikkim where he is posted. Bankers are not always rude. His wish was granted. If you are not having it today, you will have it tomorrow. Do you know, you were born without knee-caps? It gradually developed with age. It’s high time to Patiently Embrace The Change! Simhasta in Shajapur ? What the hell is this crowd doing in front of my office. I crossed the well packed crowd shamelessly with a few “Side Hona Bhaiya” and “Thoda Khisakna Aunty” and ouch. I struck my nose on the channel gate.Why the hell is gate closed at 9 o’clock. For a moment, I was furious, the next, I was pleading the guard appointed by local police to let me enter my workplace. Both as a banker and as a common man , I could see the moist air of mess , confusion, commotion and ruckus prevailing in the bank premise. With abundant supply of staff, stationery and answers, my colleagues were trying hard to soothe winds of turbulence among the customers and non-customers who came to exchange cash. Sitting at my desk, I saw the three kinds of people constituting India : The calm-headed welcoming the change, The over-reacting confused as ever and The Tensed with guilt of theft brimming in their eyes. And there exists a fourth category , who were nowhere to be seen in banks and queues but were heard over phones to Branch Managers and Chartered Accountants shamelessly asking methods of changing the colour of their money from black to white. I woke up from the deep philosophical notion of Changing India when Manager Sir asked me to sit at the payment counter. Rest of the day I struggled with crunching numbers of payments and the ultra-sharp ₹2000 banknote that repeatedly cut my index finger. Banks were closed late, clock striking near 12. And while one of my colleagues asked to “make a straight line” , the other mumbled “bhaiya ghar ke chhape notes to lana hi mat mere paas” in their sleepless dreams, I was struggling with just a single thought ‘ How is my retired Dad going to pay the labourers working on our Dream Home.But then ! Country has been through worse – terrorism , natural disasters, dictatorship, emergency , corruption, discrimination etc. A ray of hope in the form of change lulled me to sleep.